It's no big shocker that everything old becomes new again. It's hip to wear old-school gear. I'll admit I still love me some bell bottom jeans from the 1970s. 1980s neon colored fashions, ballet slippers, gummy bracelets and accessories can easily be purchased at any mall in America today. There is, however, one '80s fashion or clothing item I truly never want to wear again. I'd even take leg warmers over these suckers! Okay, for the younger readers who have no idea what I'm talking about... Parachute pants were made of nylon material and featured crap-loads of zippers perfectly positioned along the leg and backside. Parachute pants became really popular with break dancers because the nylon material made spinning on cardboard much easier than denim. 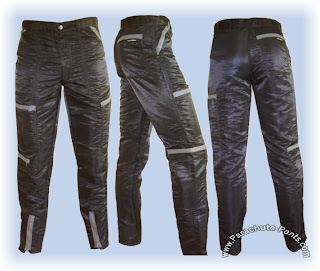 Loved the parachute pants but sadly, never owned a pair. It'd be quite a sight but I'd probably try to squeeze into a pair just for shits and giggles. They made everyone look fat AND they were horrendously hot to boot. Good riddance!!! I think craploads, as a word, is highly underrated. :) It should be part of our everyday vocab, if you ask me. Oh yuck. And remember skidz? I thought the MC Hammer pants were parachute pants? Or were those harem pants? are you gonna judge me if i tell you I want a pair? Those were horrible! That's one trend I didn't fall for. I didn't wear them...and I don't miss them! But I did peg my pants. Lifetime of embarrassment over that decision, even though I was 12! Whoa! That takes me back. I had such a crush on the girls in my grade that used to wear 'em. "Parachute pants became really popular with break dancers because the nylon material made spinning on cardboard much easier than denim." hm.... that must be why my break dancing career has yet to take off. ps: someone named Fourth Grade Nothing got an award on my page. i don't know if you're into those things, but just take a look and humor me. Now those pants are a blast from the past. I owned several pairs too. What was I thinking??? I never understood the draw of them. They just weren't pretty. They make me think of Eddie Murphy. Remember that comedy show he did where he was in red leather with zippers everywhere?? They are and were ugly. True story: I had a friend that had a domineering mother that would force my friend to wear those pants to school in Jr. High. He would wear the pants HE wanted to wear under them and change them before going home. Maybe I am odd, but they don't look so bad to me...I would much rather see them than those horrible baggy pants worn halfway down the waist! I really didn't mind them. Then again, I never owned a pair either. I think I mentioned before that I used to work at Discovery Zone. The uniform there was a golf shirt adn parachute pants. We all made that ffrrrt ffrrrt noise every time we moved...drove me crazy. But great for staying clean in kiddie bday parties! Oh....I think I had a pair of those in khaki! Looking back, they really ARE ugly! I had a pair of these also. They were gray. And when I wore them, I felt very stylish. I was never even interested in getting a pair of parachute pants, thank goodness. I did have a couple of pairs of those tight peg-leg pants/jeans but I didn't care for them that much. hahahahaha, literally LOL'ing here. Oh boy... they remind me of Michael Jackson's Thriller outfit pants. takes me back! Suprisingly I never owned a pair of those... and I don't think I ever will. Worst. Fashion Trend. Ever. Hands down! Those were and remain frieghtening. Do you know where I can get a pair of these? Just fab!! What, no mention of M.C. Hammer? I think he deserves a shout out. I'm going to create a new style and actually make pants out of a parachute. I had a pink pair when I was like 8. I was stylin! I loved these. I had a red pair and I wore them with a shirt that the body was black & white check with red sleeves and a skinny red belt that was worn either double wrapped or wrapped around the waist once and across the chest. I loved these. I thought they looked hot on everybody. I loved the 80's.